When a glacier warms, the rate of melting increases because meltwater lubricates the glacier and causes it to slide more and melt faster. Once an ice sheet begins to break up, it may not stop until it has all melted away, or until the next ice age arrives. Although no one can know what the tipping point for the Greenland ice sheet is, many scientists think it could be reached with a regional temperature increase of 5°F (2.7°C), which corresponds to a global increase of 2.7°F (1.5°C) above the present level. This magnitude of global increase could be reached through a doubling of CO2 and could occur as early as 2080 or even sooner. After this tipping point is reached, thermal inertia would keep the ice sheet from melting abruptly. Eventually, though, the ice sheet would melt completely, raising the sea level about 23 feet (7 m). Just as different models of climate change predict different temperatures by 2100, they also predict different amounts of sea level rise. The area with the darkest shading in the center represents model averages; the lighter color introduces more uncertainty in ice-land interactions and thermal expansion of seawater; and the outlying lines envelope possible sea level rise taking all uncertainties into account except possible changes in the West Antarctic ice sheet. by 50 cubic miles (208 cubic km), as more of the ice sheet melts and more giant icebergs calve into the sea. In early May 2006, temperatures were almost 20°F (11°C) above normal, just below freezing. Prolonged local heating of that magnitude could greatly hasten the loss of the Greenland ice sheet. Climate Change, Rapley wrote, "The last IPCC report characterized Antarctica as a slumbering giant in terms of climate change. I would say it is now an awakened giant. There is real concern." 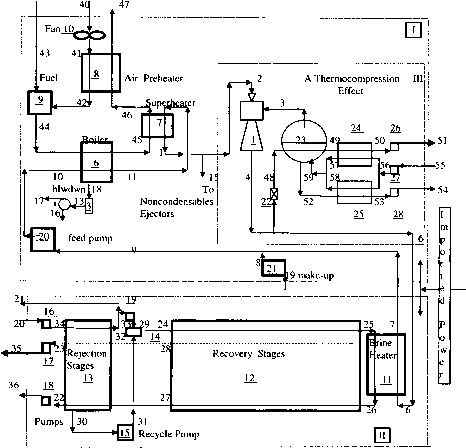 The total collapse of the WAIS could raise sea level by 16 feet (4.9 m). 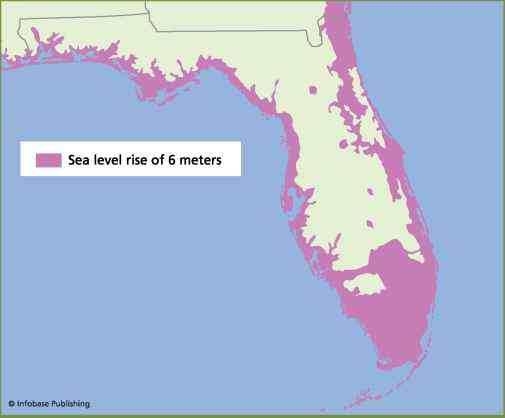 A 20-foot (6-m) rise in sea level would drown the southern one-third and coastal areas of Florida and make regions that are now well inland vulnerable to ocean storms. Al Gore's book An Inconvenient Truth, a 20-foot (6-m) rise in sea level will displace 20 million people in Beijing, China; 40 million in Shanghai, China; and 60 million in Calcutta, India, and Bangladesh. The melting of ice sheets would be fairly slow because of thermal inertia, but history indicates what will happen once this melting occurs. When the average temperature was last 5°F (2.8°C) globally and 10°F (5.6°C) at the high latitudes, about 3 million years ago, sea level was 80 feet (24 m) above what it is today. A rise of that magnitude will partially or wholly inundate many regions, including San Francisco, New York, portions of Los Angeles, Washington D.C., and nearly all of Florida and the Gulf of Mexico coastal region. Globally, Tokyo, London, Beijing, and much of the Netherlands would be submerged.